QB Jimmy Garoppolo on play action — Jimmy G on play action was a topic in last week’s preview as well, but it’s already worth revisiting after just one game. During his brief time as New England’s starter last season, Garoppolo had the fourth-worst passer rating on play-action dropbacks (61.8), making it one of the few weak spots of his game during that stretch. Last week against the Bears, Garoppolo completed all eight of his play-action attempts for 105 yards, good for 13.1 yards per attempt, the third-best figure of the week. The opportunity to put up those type of numbers should be there again this week in Houston. The Texans have surrendered a league-worst 133.9 passer rating on play action this season, allowing 11 touchdowns (most) and a gaudy 11.0 yards per attempt — the Colts are the only other team to allow even 10.0 yards per attempt when facing play action. WR Trent Taylor vs. CB Kareem Jackson — Garoppolo taking over at quarterback also proved to be the catalyst for the best game of Trent Taylor’s young career. The rookie slot receiver earned an 86.9 overall grade against the Bears, his best of the season and the fourth-best given to a wideout on the week. Taylor caught all four of his slot targets for 72 yards, with only Jermaine Kearse (4.55) topping Taylor’s 3.60 yards per route run out of the slot in Week 13 among qualifying wideouts. It’s likely the 49ers will try and take advantage of the Garoppolo-Taylor connection again this week, as Kareem Jackson has struggled in the slot this season. Opposing passers have a 123.1 passer rating when targeting Jackson in slot coverage (sixth-worst of 50 qualifiers), and he’s one of only four qualifying cornerbacks to allow more than 2.00 yards per cover snap in the slot this season (2.05). T Joe Staley vs. 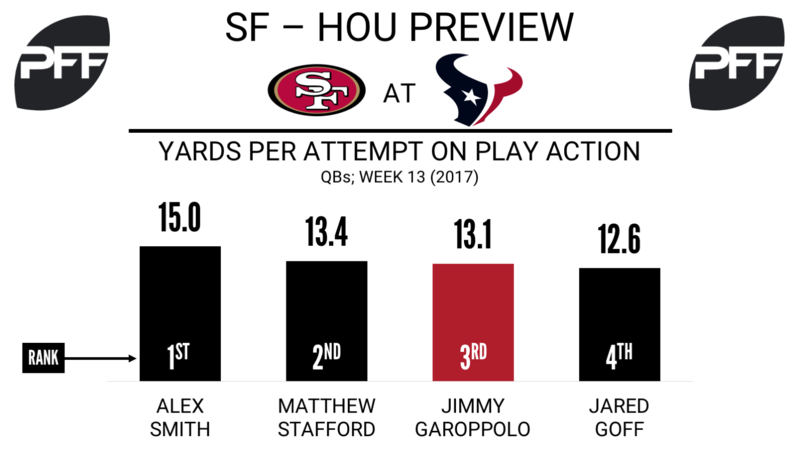 Edge Jadeveon Clowney — San Francisco’s offensive line did a good job keeping Garoppolo clean in his first start, as he was pressured on just 25 percent of his dropbacks, the fourth-lowest rate last week. Staley’s performance was a big part of that, with the veteran left tackle keeping a clean sheet in pass protection on 40 pass-block snaps and earning a spot on the PFF Team of the Week. After a bit of a rough patch in the middle of the season, Staley has now allowed just three quarterback pressures in his last four games. In Houston, Staley will spend much of his day against Clowney, who has been doing a better job getting to the passer since the Texans’ bye week. Since Week 8, Clowney’s 25 total quarterback pressures are tied for the eighth-most among edge defenders. 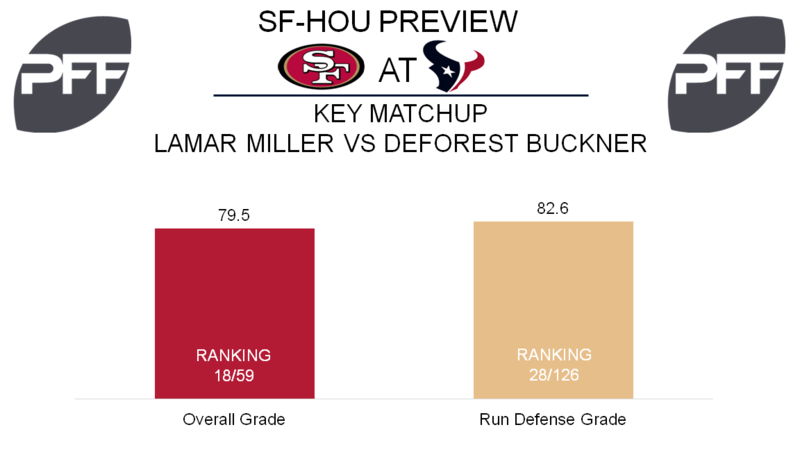 RB Lamar Miller vs. DI DeForest Buckner – In the last three games, it has been tough sledding for Miller on the ground. Of his 168 yards in that span, 140 came after contact. Miller’s overall grade of 79.5 ranks 18th among running backs, and due to injuries at the position, he has seen around 20 touches a game of late. This week, Miller figures to see Buckner frequently. Coming in with an overall grade of 88.2, Buckner is establishing himself as a premier interior defender in his second season. While his pass-rushing grade of 86.1 stands out, Buckner’s 23 run stops rank sixth among interior defenders. It is worth noting Buckner’s three missed tackles in run defense ranks 13th, so that creates some optimism for Miller if he’s asked once again to create after contact. WR DeAndre Hopkins vs. CB Dontae Johnson – In the last five weeks with Tom Savage at quarterback, Hopkins has seen 59 targets, which leads the league. How efficient that has been is debatable, as in that span Hopkins’ passer rating when targeted of 78.2 ranks 57th among 75 qualifying receivers but his 2.25 yards per route run still ranks 14th. Primarily lining up on the left side, Hopkins figures to see a favorable matchup against Johnson. For the year, Johnson’s overall grade of 42.4 ranks 104th among corners, while his 1.38 yards allowed per coverage snap is 91st. Considering Johnson’s passer rating of 107.3 when targeted and that the Texans trust Hopkins against anyone in single coverage, another game with at least a dozen or so targets seems very likely. TE Stephen Anderson vs. LB Reuben Foster – Due to injuries at the position, Anderson saw a drastic increase in snaps played last week and was targeted on 12 of the 48 routes he ran. A former college receiver, Anderson’s receiving grade of 73.2 ranks 16th among tight ends, and his experience at wideout helps, as he has lined up in the slot on occasion. This will be a nice test for Foster, who is making an immediate impact with an overall grade of 87.7 that is fifth among linebackers. In coverage, Foster is allowing 0.73 yards per coverage snap, which ranks ninth at the position. One interesting wrinkle to follow will be who wins after the catch. Og Foster’s 101 yards allowed in coverage, 73 have come after the catch, while Anderson’s 93 yards after the catch rank 34th at the position.